de Souza e Silva, A. (2012). Introductory remarks: Mobile communication, community and locative media: From the everyday to the revolutionary. ICA Mobile Communication preconference. Phoenix, AZ: May 23-24.
de Souza e Silva, A. (2012). Introductory remarks. 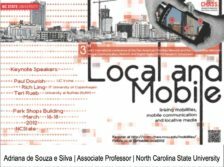 Local and Mobile: Linking mobilities, mobile communication, and locative media. The 3rd CRDM Research Symposium and the 3rd joint international conference of the Cosmobilities Network and the Pan-American Mobilities Network. March 16-18, Raleigh, NC. de Souza e Silva, A. 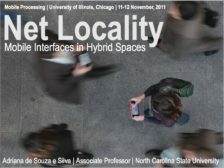 Net Locality: Mobile interfaces in hybrid space. Mobile Processing Conference. University of Illinois, Chicago, IL: November 10, 2011.
de Souza e Silva, A. 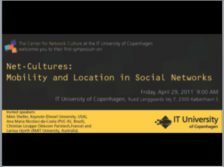 Introductory Remarks: Net-cultures: Mobility and Location in Social Networks. Research symposium of the Centre for Network Culture. IT University of Copenhagen. Copenhagen, Denmark: April 29.
de Souza e Silva, A. (2010). Location-based mobile games: Interfaces to urban spaces. Homo Ludens 2.0. The University of Utrecht, The Netherlands: November 17-18.
de Souza e Silva, A. (2010). Network locality: Reconfiguring surveillance, privacy, exclusion and public spaces in contemporary society. Series of talks in Digital Humanities, Media and Culture. University of Maryland. College Park, MD: March 05.
de Souza e Silva, A. (2010). 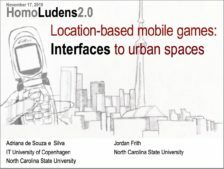 Location-based mobile games: Interfaces to urban spaces. CHAT Festival. UNC Institute for the Arts and Humanities. Chapel Hill, NC: February 20.
de Souza e Silva, A. (2009). On the social implications of network locality: Sociability, privacy, surveillance, exclusion. School of Media and Public Affairs. George Washington University. Washington DC: October, 29.
de Souza e Silva, A. (2009). Playing life and living play: How hybrid reality games reconfigure space, play, and the ordinary. Floating Points 6: Games of Culture | Art of Games. Boston, MA. Mar. 21.
de Souza e Silva, A. (2009). Hybrid reality and location-based mobile gaming: Potential uses in educational contexts. Is Learning a Serious Game? Teaching, Learning & Technology Roundtable (TLTR). NC State University. Raleigh, NC: Feb. 04.